2016 Election: A UX Race to the White House. Every January, I anxiously await the season premiere of the Bachelor; each season reaffirms that there is at least one person out there who is more dramatic than myself. But my commitment to the Bachelor has been slacking this season as I have found myself glued to the presidential debates. Similar to the “OMG-can you believe she said that? !” viral moments which dominate my Facebook newsfeed and text message conversations, this year’s candidate controversies and “OMG-can you believe he said that?” moments have captivated every news and digital media source. Who would have expected that the 2016 Presidential Election would be juicier than the fantasy suite date?! As a user experience researcher, I’m fascinated by the many ways in which our lives are shaped, improved, and sometimes complicated by digital tools and experiences. So I dove into this rich topic to understand how user experience might be impacting voters. At the intersection of money, politics, and votes, candidates cannot rely solely on earned media to mobilize voters and donations. Campaign strategists must synergize technology, money, and supporters to engage volunteers and increase campaign donations. I hope what I learned inspires campaign strategists to create user experiences that increase voter turnout and get more people involved in the future leadership and direction of our country. Why is user experience important in the 2016 Presidential Election? In 2012, Jason Kunesh, Director of Obama for America’s Campaign, utilized volunteer usability researchers across the US to conduct remote usability testing to optimize online behaviors leading to offline actions and results. So we’ve learned from recent elections that the digital stakes are high when it comes to campaigns. And it’s essential for the prospective presidential candidates to gain momentum in the next few weeks in order to influence the media’s narrative and delegate count of the party nomination. From July to November, candidates must refine their digital strategies to educate voters on their platforms, raise funds, and increase volunteer reach to win this highly competitive 2016 election. 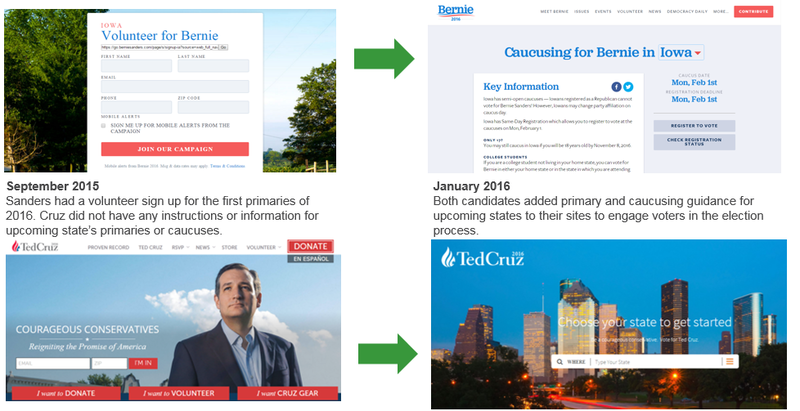 I decided to look at each candidate’s digital home base –their campaign websites. But what makes a successful campaign site? 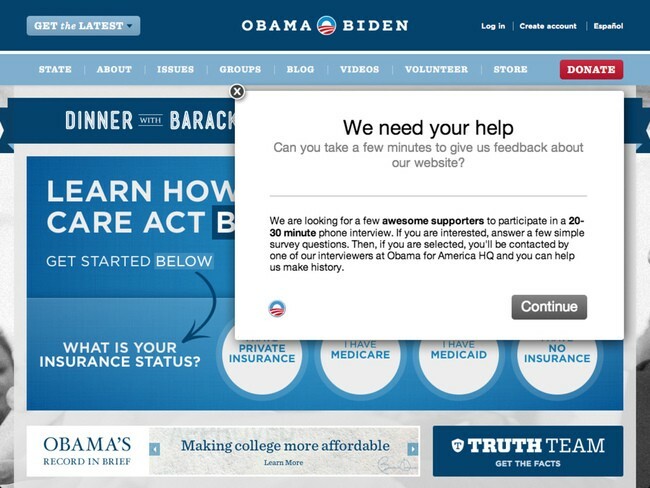 2) What are the most effective calls to action on campaign sites? 3) What relationship, if any, is there between digital calls to actions and offline voter behavior? To answer these questions, I conducted a heuristic evaluation of the Top 2 Republican and Top 2 Democratic candidates. I finalized the Top 2 Republican candidates on Super Tuesday, March 1st, 2016 based on the number of pledged delegates. On a scale of 1 (Very Poor) to 5 (Excellent), I rated each campaign site based on these key user experience elements: utility, usability, performance, engagement, and visual design. To counter order and personal bias, I analyzed each candidate for 4 weeks capturing screenshots of the site’s features, tools, messaging, and design. Each week, I alternated the order of candidates and used Chrome’s Incognito Tab to view the site as a new user with fresh eyes and perspective. To understand the evolution of each campaign site, I used The Internet Archive’s Way Back Machine to review historical desktop screenshots and identify major site changes from September through March. How do voters engage with the presidential candidates? To determine the elements of an exceptional digital campaign experience, I wanted to understand a voter’s journey navigating presidential candidates. Synthesizing my analysis across Republican and Democratic candidates, I realized that campaigns identify voters in the one of the five stages; research, compare, confirm, support, and engage. Similar to a retailer’s top to bottom funnel, campaigns need to guide voters to zero in on their preferred candidate to convert (vote), checkout (donate), and share their experience (volunteer). 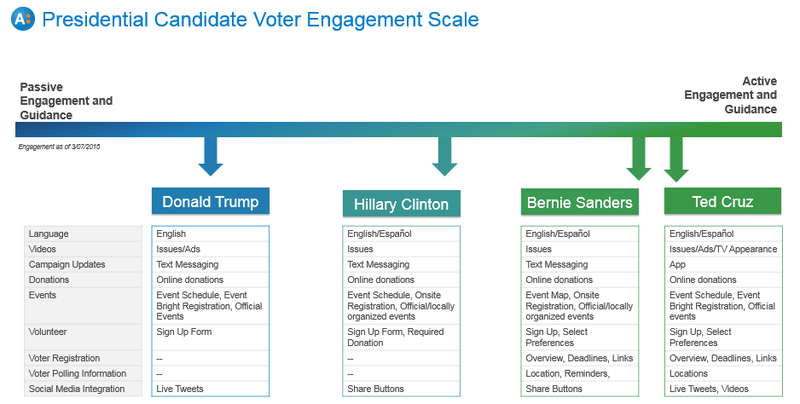 Which presidential candidate’s user experience drives the most voter engagement? With a stronger understanding of a voter’s journey, I sought to compare and contrast each campaign’s online engagement relative to the other candidates. Analyzing and synthesizing each campaign’s strategy to educate, inspire, and mobilize potential voters and committed supporters, candidate’s engagement ranged from passive to active guidance. In the passive to active engagement spectrum below, I ranked each candidate based on the following dimensions: language translations, multimedia, campaign updates, social media integration, donation process, event registration, volunteer sign up, voter registration and polling instructions. You might be thinking “Engagement — so what? Donald Trump and Hillary Clinton are leading with the most pledged delegates yet they have the lowest engagement.” And you are right. However, Bernie Sanders and Ted Cruz have stayed competitive and influenced the media’s narrative because they have significantly increased their voter engagement. From the beginning of October through the end of January, Bernie Sanders and Ted Cruz have refined their user experience to focus on registering voters and guiding them to the polls. In comparison, Hillary Clinton and Donald Trump did not significantly change their voter engagement between October and January. High engagement candidates with strong calls to action raised more money than candidates with less engagement in January. As seen in this chart below, Sanders raised more than 6.4M more than Clinton and Cruz raised 1.5M more than Trump. Candidates must optimize their user experience to stay competitive in the 2016 Election. Candidates will need to increase digital engagement with voters to mobilize money, volunteers, and votes to win the election. Research: Offer persuasive video content to educate voters and facilitate organic word-of-mouth and digital sharing of the candidate’s platform and message. To educate voters, Cruz and Trump host multiple videos explaining their stance on specific issues, controversial commercial and video advertisements, and TV/debate appearances. These quick sound bytes facilitate organic word-of-mouth and digital sharing more than dense written content. Compare: Provide context and comparison to differentiate the candidate from the competition. Trump differentiates himself from candidate Marco Rubio by displaying a television commercial against Marco Rubio. Clinton contrasts herself from Sanders highlighting 6 policy differences discussed at a Democratic debate. Confirm: Guide voters to registration forms and polling locations to increase voter turnout. Sanders provides instructions to find polling location, to vote as a college student, and to determine absentee voting eligibility. On Sander’s site, users can set a calendar reminder to vote in the primaries, sign up for reminders, register to voter, or check their registration status. Cruz provides details on Ohio’s voting process, requirements, and deadlines. Support: Share the impact of monetary contributions to motivate voters to donate and underscore the contribution’s urgency. On his donation page, Bernie underscores the impact of a contribution; he explains the average contribution affords the campaign two extra hours of work from a field organizer and can mobilize about ten volunteers at a single canvass or phone bank. Engage: Allow voters to choose his/her level of volunteer engagement for the candidate’s campaign. Cruz allows voters to select their preferred level of engagement from a prepopulated list of activities. Clinton does not allow voters to select their level of engagement and requires a donation to process the voter’s volunteer registration. View the “UX Best Practices for Campaign Sites” and more details of my research here. A collection of useful articles to help you find answers to your user experience questions.